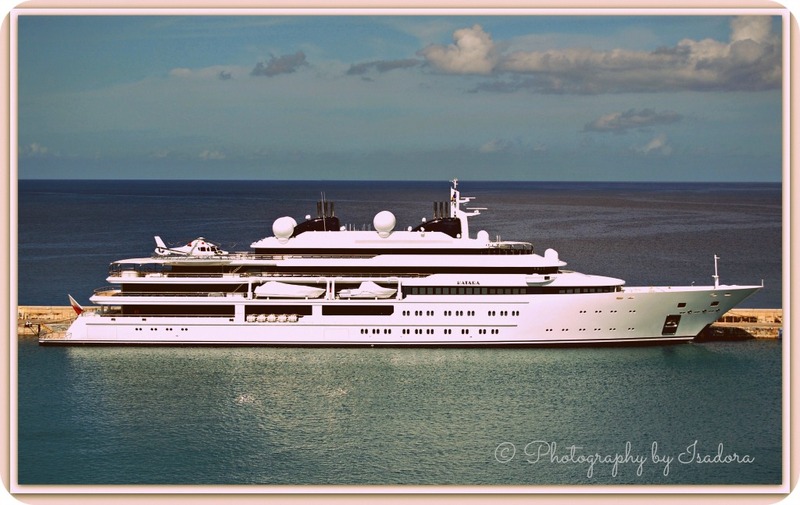 This magnificent yacht was docked at a port in St. Thomas. Yes, it had a helicopter in the rear ready for takeoff. Thank you so very much, Ayesha. It was magnificent. Yes, I used to have a yacht just like this. Had to give it up, though, once I started taking showers instead of baths. I like the progression from full color to black and white. Thank for noticing the progression in the photos. I thought it would show and give the photo an interesting perspective. When the cruise ship I was on was docking this was what I was facing. I could have oogled it all day. I was tempted to go over and knock with a few packets of sugar in had. I doubt if they run out of anything. Although, here in Florida you can rent a yacht. MMmmm … Santa – baby??? I love St. Thomas! Wouldn’t it be lovely to be there now! Have a wonderful time! 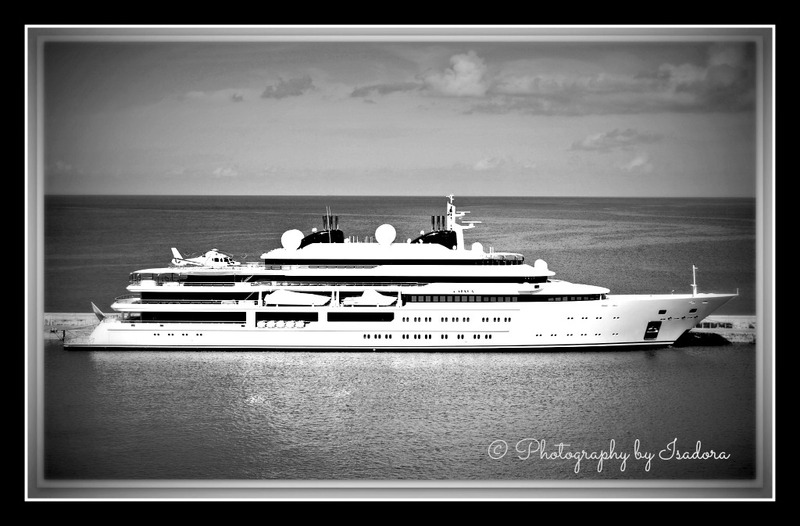 The yacht is certainly grand ! St. Thomas is a beautiful island. I enjoyed our visit there very much. In fact, they have good prices on camera equipment. I was able to get my macro lens there. Now, I see the helicopter…. Grand, Indeed!!! Now, that is astonishing … I was trying to figure out why they’d need a helicopter. Perhaps, a sinking ship!!!??? Each time I see the photo I want to hop off somewhere too. Thanks, KZ … Have a GRAND weekend !!! I have yet to be in a cruise. It doesn’t really interest me that much as I like to be on the road. I guess maybe someday. Nice submission, Isadora. I’ve taken quite a few cruises but this yacht was privately owned. It was grand to look at and quite the head turner. Did you notice the helicopter in the rear of the yacht?? Incredible and GRAND !!!!! Thanks Rommel for stopping by and leaving a comment. Happy Weekend … hope it’s GRAND !!!! Yes, Marina. Sailing away and floating on the calm water to somewhere and nowhere. It was truly magnificent to look at and to admire. Hope your weekend is GRAND !!!! Magnificent, did you cruise on it? Oh my, Gilly, I wouldn’t have minded but no I didn’t. It was docked at the port we had just arrived at – St. Thomas. I added a few lines to clarify that and used your very apropos word – magnificent.